Posted on January 3, 2018 by treelawyer	tagged. A great philosopher perhaps put it best: a very long journey can sometimes end suddenly, and rather badly. 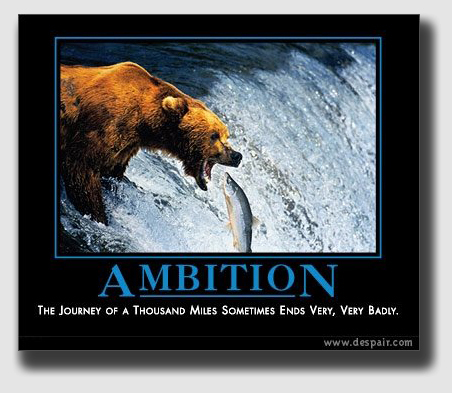 Howie Conine should have had the Despair, Inc., “Ambition” poster on his wall, where he could have contemplated its message. He surely could empathize with the hapless salmon. He and his wife had their journey end one rainy day on Washington State Route 524 – suddenly and very, very badly. A redwood tree on County of Snohomish land, the hazardousness of which was “readily apparent,” fell on their car with a readily apparent thump. But who to collect from? The State of Washington, the government that, the Conines argued, had a duty to keep the highways safe from falling trees? Or perhaps the County of Snohomish, the government that, the Conines averred, had a duty to protect passers-by from dangers arising from trees on its land? 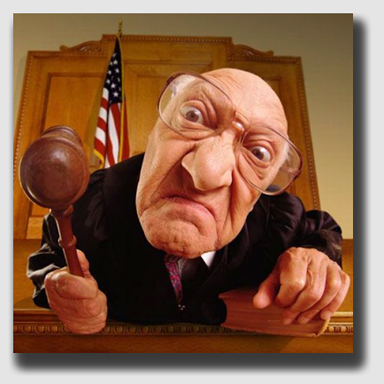 This is America – land of the free and home of the litigious! Why not sue both? That is exactly what the Conines did. Unfortunately, they ran into an uncooperative trial court, one which held that neither Washington State nor Snohomish County had any obligation to inspect the trees along the road, even one with “this readily apparent hazard.” The trial judge threw the Conines out of court. They had more luck with the Court of Appeals, which reversed the trial court decision and sent the matter back for trial on the merits. There was enough evidence – chiefly from the Conines’ hired-gun expert – that the tree was obviously dangerous, that the case should go to trial. The lesson: when you need a good expert, there’s just nothing else that will do. Conine v. County of Snohomish, Not Reported in P.3d, 2007 WL 1398846 (Ct.App. Wash., May 14, 2007). Howard and Karen Conine were driving on State Route 524 when a red alder tree standing on an embankment on the west side of the road fell on their car. The tree had been located about 10 feet outside the State’s right of way on land owned by Snohomish County. The Conines sued the State of Washington for failure to maintain the state highways in a safe condition and the County for failure to remove an obvious hazard from its property. The trial court held that neither the State nor the County had a “duty to look for this readily apparent hazard,” and granted summary judgment to the State. The Conines appealed. Held: The summary judgment was reversed. The State’s liability to users of a road is predicated upon its having notice, either actual or constructive, of the dangerous condition which caused injury, unless the danger was one it should have foreseen and guarded against. The Conines conceded that the State did not have actual notice, but they argued that the tree’s visibly dangerous condition created constructive notice. The Court found that the question to be answered was whether, for constructive notice, the State had a duty to look for a readily apparent hazard. Although the Washington Supreme Court had held in another case that where the tree was on a remote, mountainous, sporadically traveled road, a high threshold for constructive notice of danger was needed to trigger a duty to inspect and remove a dangerous tree. But here, the road was a state highway in a populated area, and the risk to the traveling public shifted the risk analysis. What’s more, in the other case, the Supreme Court found that the tree that fell was no more dangerous than any one of the thousands of trees that lined mountain roads. 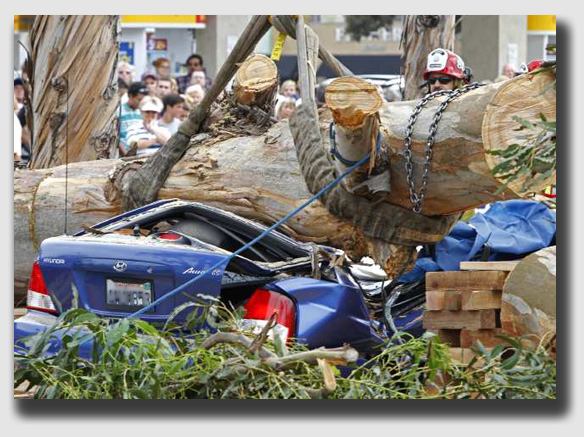 By contrast, the Conines’ expert testified that the tree that fell was obviously a hazard. The differences, the Court said, precluded a finding that the State lacked constructive notice as a matter of law. Constructive notice that a tree was dangerous gives rise to a duty to inspect. Thus, summary judgment was improperly granted on the basis of no duty to inspect. The Court held that when the land is located in or adjacent to an urban or residential area and when the landowner has actual or constructive knowledge of defects affecting his trees, he has a duty to take corrective action. The area in question was next to the City of Lynnwood and zoned urban residential. Thus, it was urban in character. The Conines produced expert evidence that the subject tree was obviously dead or dying and leaning for two years, that it looked like a forked snag and that it lacked fine or scaffold branches. This evidence, the Court said, created an issue of material fact as to whether the tree was in a defective condition and the condition was of sufficient visibility and duration to give the County constructive notice of a potential hazard.